Jogu (Sanskrit: जोगु) is a Hindu/Sanskrit Indian popular masculine given name, which literally means "praising" in Sanskrit. Jogu finds reference in Rg Veda (ऋग् वेद) with meaning Praising. Name Jogu is not that popular in the US. As per social media profile counts, Jogu is a bit popular name in India. 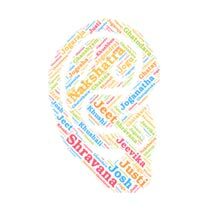 Jogu is used by less than 26 people in India as the name of their kids. As far as we can tell, Jogu is Short and Unique name. Then Jogu is a very good name from the Sanskrit origin with Very Good Meaning attached with it. Jogu has a good mythological background. It can be gaining popularity in the U.S.A as its a short name and easy to pronounce as well. Binu is a common given name for boys in Kerala state in sout..
Name Shreesha means Lord of Fortune or The Lord Of Wealth In.. Derived from sanskrit word Agasti and Agathiyar, A-ga means ..
Karthika (in Devanagari: कर्थिका, कर्त्तिका) is a Hindu girl.. Derived from Sanskrit word Rachana means "creation, arrangem..